Does Kirby's swansong on the 3DS go out in a blaze of glory or does it all come unraveled? Some nine years ago, Nintendo’s then-dominant console - the Wii - was graced with the original version of Kirby’s Epic Yarn. Nearly a decade later, the once-dominant but now waning 3DS is lucky enough to be the platform of choice for this once-great game’s reappearance, for reasons that will no doubt bewilder fans of the much-higher-flying Switch console. 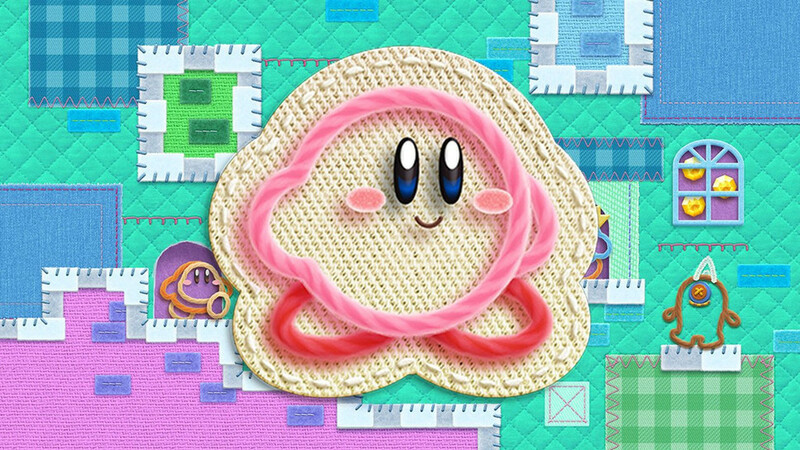 If you’re not familiar with the game, Kirby's Extra Epic Yarn sees Nintendo mascot Kirby adventuring in a parallel universe where everything is made out of yarn. 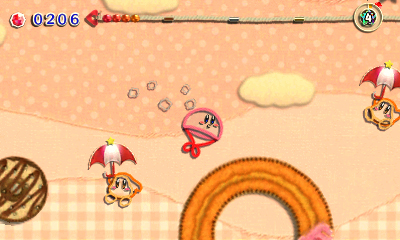 Kirby himself transforms into a short loop of pink thread and must then go about his regular shenanigans in a world that itself could masquerade quite handily as a quilt. If you’re not familiar with Kirby, well… in his first game, Kirby’s platforming adventures were based mainly around his ability to hoover things up with his extremely sucky mouth. While a great game in its own right, the original Kirby’s Dreamland was pretty tricky compared to recent entries. 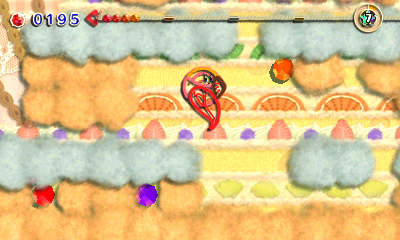 Now, while the signature sucking typically remains, Kirby is also readily associated with low difficulty, beginner-friendly, painless platforming. There’s no such thing as death in the normal mode; instead, getting your pink outline on the wrong side of a pointy thing will simply result in you - Sonic style - shedding some of your hard-earned gems and being taken back to where you were a couple of seconds before you stumbled. There’s a new “devilish” mode in the 3DS port, however, that spices things up a bit - one of these things being a kind of death mechanic. 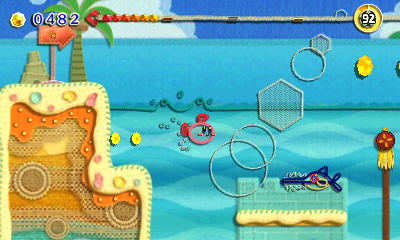 In this mode, you have a health bar, and if you get yourself in trouble too many times its level over, and you have to start over again. This is made all the more likely by the fact that you’re being pursued constantly by a powerful monster - fail to make forward progress and all of your efforts (and Kirby himself) will unravel. The impact of the low-risk, low-threat mechanics at the heart of Kirby encourage you to explore, and exploration is very rewarding. There are loads of little things to find all over the place in EEY, including various objects you can use to decorate an apartment you own in the overworld. For the life of me I couldn’t figure out why on earth you’d want to bother with this outside-the-levels aspect of the game, however - if this is your thing, Animal Crossing is a million times better - but hey, I’m a 40-something-year-old, cynical reviewer; your mileage may well vary. The actual platforming mechanics themselves are very good, although there are some slightly weird control problems that never really went away for me. For one, using the wirey powerup that gives Kirby knight-like powers moves you slightly forward; in levels where you’re fending off foes while trying not to fall off a small platform, this tends to lead to accidentally falling and losing progress - which is always annoying. Using the circle-pad is all too likely to trigger Kirby transforming into a fast-moving car, too, which will also frequently lead to frustrating loss of hard-earned (well, not really) progress. Once I “died” five or six times in rapid succession before I clicked as to what was happening, resulting in me unwittingly biffing most of my shiny currency back into the level. To avoid the car thing altogether, I ended up playing with the D-pad - which doesn’t trigger car mode unless you double-tap a direction - leading to me all but forgetting the car mode even existed, which makes later sections much harder than they should be, had I integrated the car mode into my repertoire of moves. 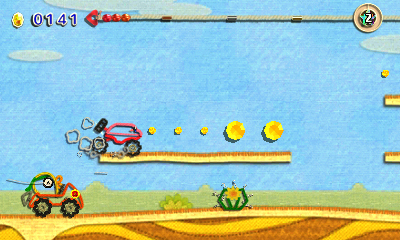 At the end of many levels, Kirby transforms into some kind of special vehicle with unique abilities which he must use to traverse the final section before the exit. There are several different types, including a large rolling tank, a UFO, and a train. The mechanics for these vary considerably, and the core idea behind each is smart, with a lot of fun on offer as you figure out how to best take advantage of your new-found form. 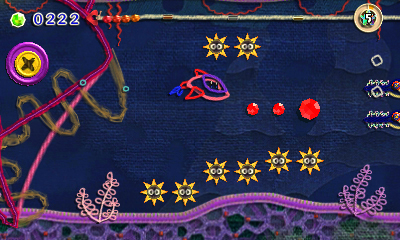 However, the controls and level layouts often combine to confound somewhat, with enemies occasionally frustratingly out of reach or the controls preventing you from collecting that thing you want that’s right in front of you. It’s not a disaster, by any stretch of the imagination, but it is somewhat bewildering given Nintendo’s decades-long reputation for absolutely nailing this stuff. That said, this game is far from hard - even in later levels. Very few things even damage you on most levels, and the challenge comes mainly from making a series of jumps - a trick the game gives you a lot of tools to help with. It really is suitable for all but the numptiest of gamers to play, while somehow also offering a fun experience for those of us that have been around the block a few times. The game’s fabric-based visual language is just as suited to the 3DS’s tiny screens as it was our ten-year-old tellies, with clear, appealing visuals perfectly framing the family-friendly gameplay that sits front and centre. The fact that your character is an outline just a few pixels across and yet always highly visible is an art direction tour de force - the sheer amount of personality he manages to exude while being so diminutive is a masterclass for budding character designers. I personally prefer Mario’s brand of platforming fun but having time to explore each level was particularly welcome after being subjected to serious time pressure in the recent Super Mario Bros. U Deluxe. There’s something relaxing about Kirby’s adventures that just soothes the soul, and what is sure to be his swansong on 3DS is no different - justifying its place in even the most discerning gamer’s collection. Recommended. Ups A serene, newbie-friendly, satisfying, and visually appealing adventure. 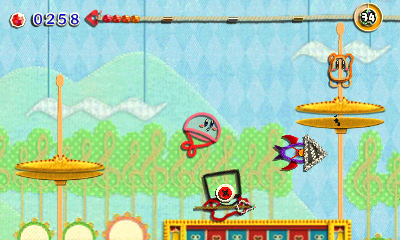 Downs Ccontrols not as tight as you’d expect for a Nintendo platformer.